600 is a wonderful number. Can you hear it? The topics vary and the reasons for forming a network are many, but Radia has become a concrete manifestation of the desire to use radio as an art form. The approaches differ, as do the local contexts; from commissioned radio art works to struggles for frequencies to copyright concerns, all the radios share the goal of an audio space where something different can happen. That different is also a form in the making – radio sounds different in each city, on each frequency. 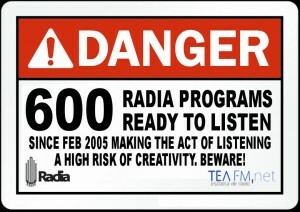 Taking radio as an art form, claiming that space for creative production in the mediascape and cracking apart the notion of radio is what Radia does. On 3–7 February 2005, there was a first meeting of radio stations in Berlin under the banner of NERA (New European Radio Art). The decision was taken to start a broadcast season the following April, and an email discussion list was set up on which the name Radia was finally settled on. 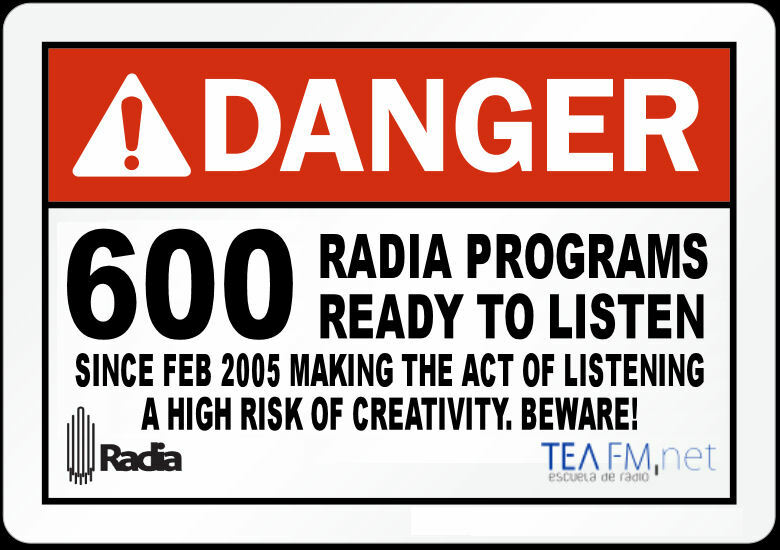 The originally Radia found members were 9 radio stations and now we are 29 radio stations, webradios and art-radio projects that broadcast the Radia weekly show and produce shows in turns. Can you hear it? This is creativity and sound art. This is RADIA. Welcome. This entry was posted in #37 and tagged TEA FM. Bookmark the permalink. Pingback: » Les Sons Créatifs – Programmation spéciale !